Next week it will be exactly four years since the escalation of the conflict in Yemen – having lived through violence, hunger and restrictions, in their Peace Resolution the children demand an end to the war, the right to education, free movement and freedom from fear. Yemen is the largest humanitarian crisis on earth, where 24 million people – 80 percent of the population – need humanitarian assistance and protection, and almost 10 million people are one step away from starvation. Around 10 million children don’t have access to adequate healthcare, one in three girls and one in four boys don’t go to school, and 1,5 million children fled their homes to escape hunger and violence. 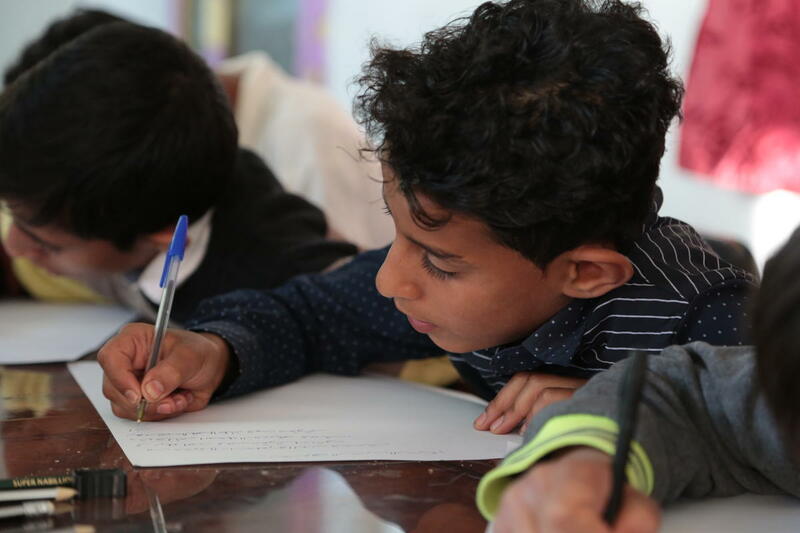 Under the supervision of trained child protection officers, the children were asked to write how they feel about the conflict in Yemen. Their honest responses give a unique insight into a child’s experience of war. “When we walk, we are scared, when we sleep, we are scared. When we play, we are scared. We don’t want to live in a warzone anymore, we are sick of it…We are innocent. We are children just like any other children, just like your children. “We believe only words, not weapons, can bring peace to Yemen’s children. And the children have told us very clearly that they expect better from the international community, by whom they feel abandoned and neglected. Children are dying every day because of the lack or denial of food, a lack of medicines, because of violence. Around 240,000 people are living through catastrophic levels of hunger and are barely surviving – half of them children hovering on the brink of starvation. “Children feel the destruction around them and they see what is needed on the ground. Peace, food, education. As 80 percent of the Yemeni population requires some sort of humanitarian assistance with millions of children on the brink of starvation, it’s more urgent than ever for world leaders to put children front and center of its foreign, defense and aid policies. That means calling out allies when they violate humanitarian law, suspending arms sales to warring parties that are killing children in Yemen, and implementing a clear strategy to protect children and their families caught up in conflict.